Novelty Lights, Inc. super bright 100 light wide angle mini lights have 100 commercial grade LED's on 6" centers making each string 50' long. Because these strings have non-removeable LED's this eliminates failures from loose, broken, or removed bulbs. These commercial grade LED Christmas lights are durable, long lasting, and extremely energy efficient. Each string is full wave rectified, which eliminates any flickering making these LED Christmas lights brighter than ordinary LED mini Lights. Each LED uses a patented concave design making these LED viewable from all angles. Energy Star qualified and UL Listed for indoor and outdoor use. Connect up to 21 strings end-to-end. Your satisfaction is our #1 priority and if you have any issue please contact us and we would be glad to help. 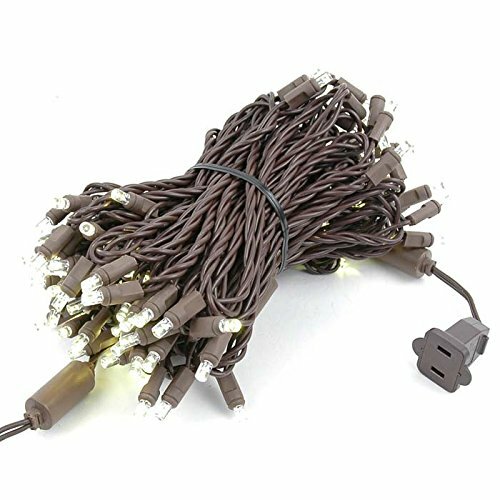 Novelty Lights presents this commercial grade 22 gauge Brown wire LED Christmas mini light set that has 100 lights spaced 6" apart and is 50 feet long with a 6" lead wire. 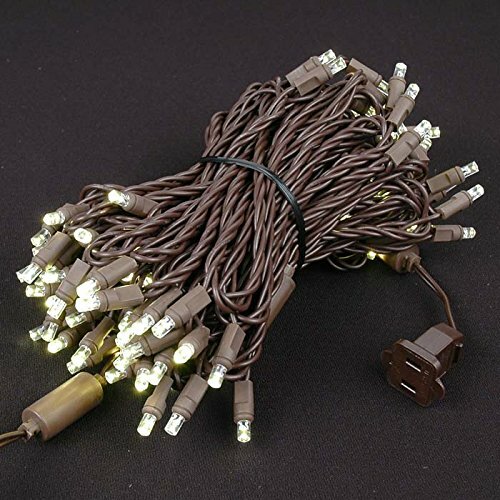 This LED mini light set is connectable end to end meaning that each string is made with a male and female plug. Each set comes with 2 extra fuses for replacements. 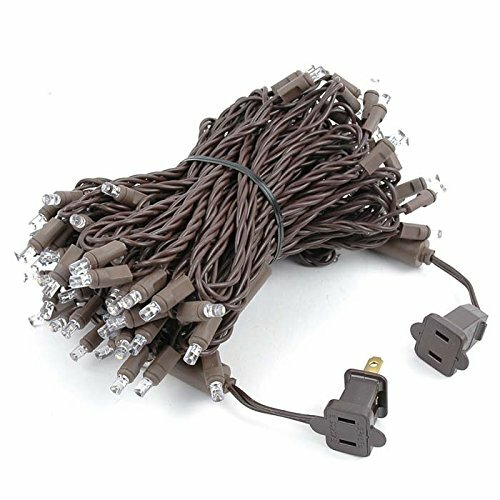 The set is connectable end to end and can be connected end to end up to 21 string for a total of 1,050' on one plug. Each set is UL listed for indoor and outdoor use. 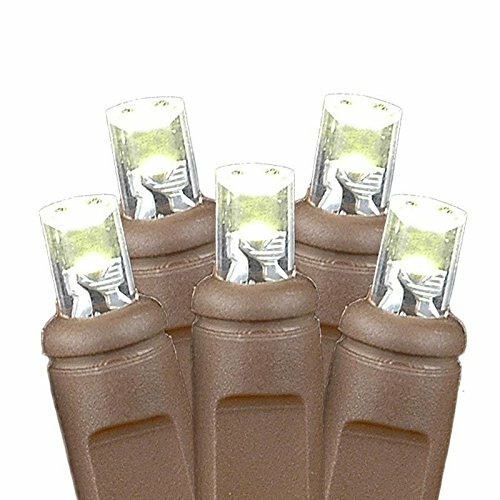 Great value and quality for a specialty string of lights perfect for Christmas tree's, wreaths, wrapping tree's, patio's, restaurants, bars, and pergolas. Our LED mini light set is energy efficient and uses only 9.6 watts per string and are slated to last 40,000 hours. 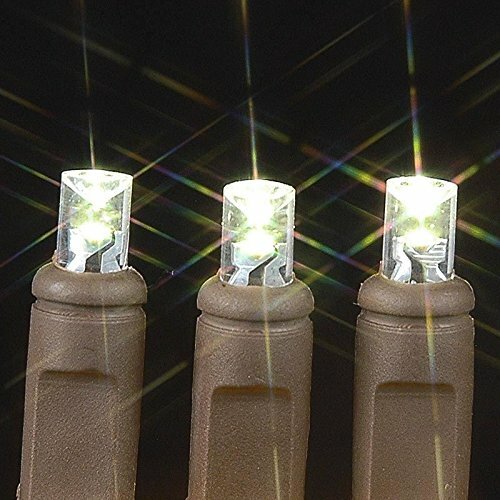 Each set is made with a sealed pre-molded bulb which has been tested to cut down drastically on defects and provides years of use with a 3 year warranty on each string. Every set is made with a built in rectifier that eliminates any bulb flicker and is very convenient that no extra adaptor is needed. Each concave bulb is 5MM and is commonly known as a wide angle bulb because you can see the brightness of the bulb from a full 360 degrees around. Lighting Application Examples include: Use on Christmas lights, wreaths, tree's, bushes, hedges, fences, pillars, weddings, holiday decor, prom, dance functions, restaurants, halloween, bars, patio's, pergolas, or wherever decoration lighting is needed.